The FCC voted unanimously today, with one partial dissent, to adopt a one-touch, make-ready (OTMR) policy for new broadband attachments on utility poles in order to speed up broadband deployment and competition. The policy “makes clear” that states and local governments are not to impose moratoria on broadband development. 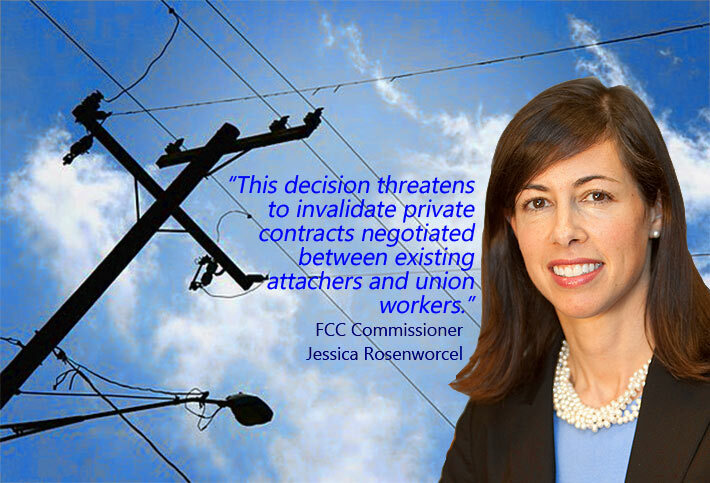 Commissioner Jessica Rosenworcel agreed with accelerating pole attachments, but dissented in part, saying there was not enough clarity about important details, which would ultimately slow broadband deployment. Rosenworcel also said that the OTMR was “giving short shrift” to employees covered by collective bargaining agreements. “This decision threatens to invalidate private contracts negotiated between existing attachers and union workers. But going forward, this agency could put those employees out of work. This is not right. Moreover, it is not an outcome we can simply ignore,” Rosenworcel said in her statement. Conversely, the OTMR will provide additional work for the nation’s non-union broadband workers. The National Association of Tower Erectors (NATE), whose membership is primarily non-union, welcomed the OTMR passage. “The FCC’s action will significantly enhance efforts to facilitate broadband deployment by reducing costs and expediting the process associated with attaching new network facilities to utility poles,” NATE said in a statement. “I would like to thank the FCC for keeping their foot on the gas for 5G deployment. 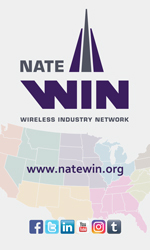 The industry will continue to flourish under lighter regulation,” said NATE Chairman Jim Tracy from Burley, Wash. “NATE member companies are on the front lines densifying networks and installing equipment on utility pole structures on a daily basis and will experience first-hand how today’s action will serve to streamline installation activities moving forward,” added Tracy. In a statement FCC Chairman Ajit Pai summarized what OTMR is. “OTMR promises to substantially lower the cost and shorten the time to deploy broadband on utility poles. It allows a new provider who wants to attach to a pole to move all the wires and equipment in just one ‘touch.’ It’s a bit like having to go to the grocery, the dry cleaner, and the bank. The slow way to do this would be to visit each business but return home each time. The rational thing we all do is to do each errand, one after the other, all on one trip,” Pai said. “It’s also been suggested that OTMR undercuts collective bargaining agreements. Again, Google Fiber points out that ‘no other proposal is more self-serving than . . . insistence that new attachers be obligated to honor existing attachers’ collective bargaining agreements . . . . Google Fiber has no problem using union contractors that have been approved by the pole owner. But the reality is that, in many areas, no such contractors exist; instead, in some of these places, the only [union] members covered by . . . collective bargaining agreements are [the] employees [of existing attachers],” Pai said. By some estimates, one-touch, make-ready alone could result in approximately 8.3 million incremental premises passed with fiber and about $12.6 billion in incremental fiber capital expenditures, the FCC said. The process will not apply to more complicated attachments, or above the “communications space” of a pole, where safety and reliability risks are greater, but the Order improves current processes for attachments in these spaces. Commissioner Brendan Carr, who shepherded the OTMR, gave credit to the Wireline Competition Bureau and the Wireless Telecommunications Bureau in particular for their work on the pole attachment policy. “At the FCC, we have been working to streamline and reduce barriers to these small cell deployments. And today’s decision is another good step in that direction. By making it easier for providers to safely and efficiently attach broadband-capable fiber and cable lines to utility,” Carr said.